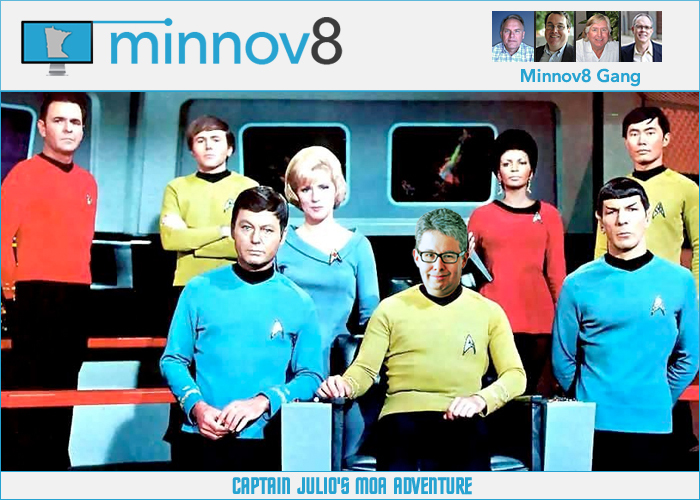 As a tech journalist in recent years, I’d periodically serve as a guest host on the Minnesota-based Minnov8 Gang Podcast with regular hosts Steve Borsch, Tim Elliott, Graeme Thickins and Phil Wilson. That was fun, but the best part came after the show. Steve, who is a whiz with image-editing software, would often insert my likeness into hilarious graphics that echoed a topic on the day’s program or something memorable I uttered as the episode was being recorded. Steve at first was a bit worried I’d think he was making fun of me, and be offended, but I loved his handiwork and considered it a compliment, an honor. I mention all of this because the tech-related podcast and its companion tech blog are, as of April 8, no more. You will always be our friend and someone we are lucky to know and as a fellow geek, you have never been judgmental about our lust for all things techie, no matter how strange or obscure. Also appreciate that you, too, have never been mad about your face being stuck on some Photoshop image. Thanks, guys. It’s been swell.